If you're on the hunt for an affordable set of blending tools I've found a vibrant answer; Spectrum Collections 8 Piece Eye Blending Set. Whoever said it's well-worth investing in a good set of makeup brushes wasn't wrong. But with budget brush brands upping their game, its become clear that good quality brushes do not necessarily have to cost a lot. 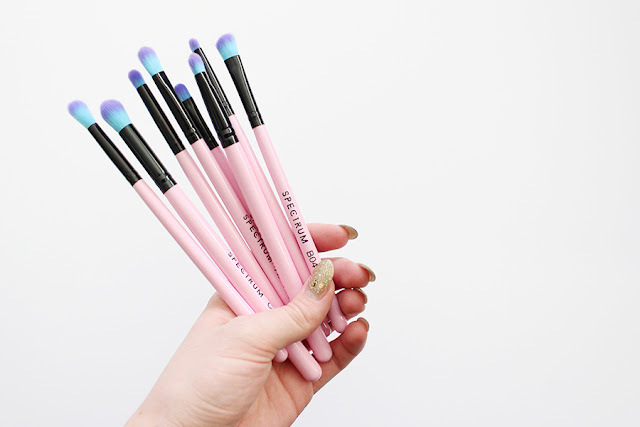 Before we get on to technicalities, I think we can all agree that Spectrum Collections sell the prettiest and most Instagramable brushes ever, with their aesthetically pleasing pastel pink handles and blue ombre bristles. You'll also be happy to hear their brushes are vegan, cruelty free, hand finished and made from the highest quality synthetic hair. In fact, they're the softest synthetic brushes I've ever felt without feeling flimsy or cheap. All the brushes pick up pigment well and they wash clean with a trusty bar of Simple soap. The 8 piece eye blending set from Spectrum Collections arrived packed in a plastic zip lock travel pouch and includes everything you could possibly need to master that smokey eye: Precision Crease, Tall Tapered Blender, Small Angled Shader, Medium Fluffy Shader, Stubby Shader, Fluffy Pencil, Short Smudge and Tulip Eye Contour. And they're a complete bargain priced at just £29.99, especially as individually the brushes cost £3.99 - £4.99 each. So if you're after a girly, fun and brush set that won't break the bank I recommend you take a look at what Spectrum Collections have to offer. But be quick on the mark - this brush set sells out like hot cakes! Have you ever tried any brushes from Spectrum Collections?